This chapter will consider neuropathologic features of CAA, an approach to grading the severity of CAA using straightforward morphologic criteria, and consequences of CAA in the brain; especially cerebral hemorrhage. 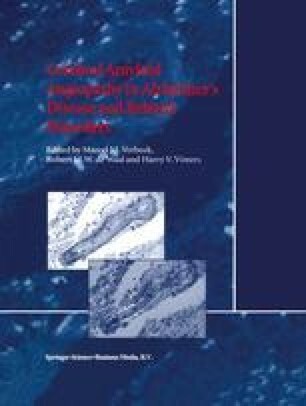 Specifically, we will evaluate the relationship between sporadic CAA and that related to Alzheimer disease, unique neuropathologie features of CAA-related brain hemorrhage, and introduce the concept of CAA-associated microangiopathies (CAA-AM, e.g. microaneurysms, secondary angiitis, etc. ); lesions that may well be the proximate cause of brain hemorrhage. Approaches to studying CAA pathogenesis and CAA-AM will be discussed in relation to the basic biology of the cerebral microvessel wall and its components, aspects of which are taken up elsewhere in this volume.